If you’re stumped on how to add character to a builder grade home, you’ve come to the right place. There’s several ways to do that will turn your cookie cutter home into one filled with custom charm. Do you want a home that’s filled with unique charm, character and where rooms have a story to tell? But your new home is cookie cutter to say the least? Don’t worry! With a few well thought out choices, you too can have a home full of character…even if it’s faking it! Click the links below to skip to each section or scroll through for the entire post. Turn to your walls to easily transform a room. The following are all easy ways to add some architectural interest to boring walls which in turn will add serious character and charm to your home. I know what you’re thinking – shiplap is a trend that’s on the way out. Maybe it is and maybe it isn’t. Firstly, many trends are cyclical. How many times have bell bottom jeans and crushed velvet come back in style? The same holds true for home decor trends. Secondly, if you love, then go for it and don’t worry about what the “experts” say is trendy or not. Who cares! It’s your home, so do what you please with it! Adding planked walls to your home can be done in various ways. You can go the tried and tested route of real shiplap but beware that it’s expensive and labor intensive to install. You can go the budget friendly option with plywood cut into strips and attached to the wall (my favorite method! cheap and cheerful!) or you can switch it up with adhesive backed products such as Stikwood which are only a couple of millimeters thick and come in a variety of rustic wood tones. 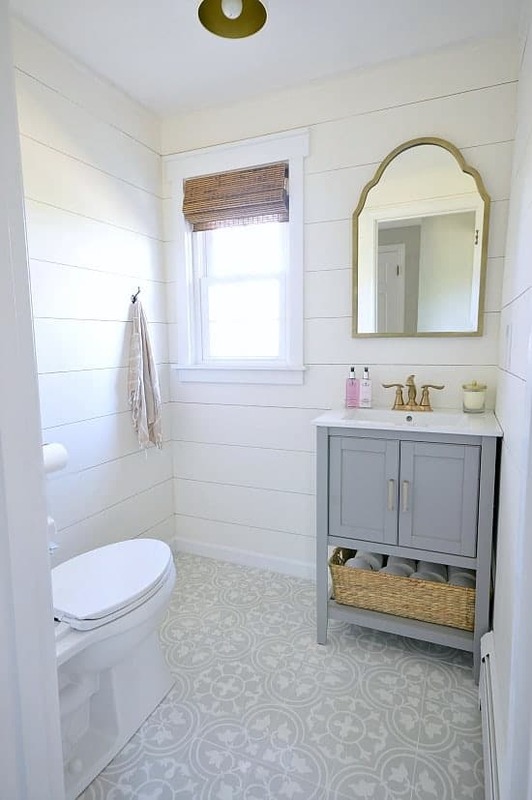 The shiplap walls in this small bathroom were created with luan plywood that was ripped down to size and attached directly to the drywall. Then lightly sanded, primed and painted. This reclaimed, real-wood product has been planed down to a couple of millimeters to achieve a weathered, rustic look plank. They are easy to install thanks to the adhesive backing and can easily be cut with a utility knife and straight edge. Because the product is so thin, you also don’t have to worry about issues with baseboards or crown molding. Shiplap Entryway via Jenna Sue Design Co.
Tongue and groove planks are more costly and labor intensive to install but really give a more authentic look for the shiplap effect. But what if shiplap and planked walls are not your thing? There’s several other wall treatments that will add the same type of architectural without risking falling into the “fads” trap. Wainscoting, board and batten as well as beadboard are more traditional finishes that will continue to look classic in years to come. Just like the planked walls, these are a simple DIY for anyone looking to add character to a builder grade home. Board and batten is one of the easiest and most DIY-friendly wall treatments. If you can cut a straight line, caulk some seams and hold a paintbrush you’ll be good to go! We added this simple vertical board and batten wall to our mudroom this past fall and it instantly transformed a dull, boring space into a light and bright dream. The entire wall, including painting above it took one weekend and only cost about $100! In the above example, we chose to add the board and batten so that it filled the majority of the wall, since we wanted to draw the eye up to create the illusion of height. However, in our first home we added a similar treatment in our dining room that was much lower. Beadboard is one of my favorite wall treatments because it covers all manner of sins. If you have textured walls, damaged walls or (like me) walls full of old tile adhesive, attaching beadboard is a great option. It’s also one of the only options that I recommend for a bathroom where there will be a lot of moisture, since it’s readily available as a vinyl product. The photo above is from my cute but oh-so-tiny master bathroom. We removed a wall full of tile and were left with lots of bright orange tile adhesive. The only wall to get smooth walls would have been to remove the drywall and replace it or sand and skim-coat. Both were too costly and labor intensive for my weekend bathroom makeover. Our solution was these vinyl beadboard pieces that slot together. They cut easily with a decent electric saw and are attached to the wall with a mixture of a nail gun and liquid nails adhesive. My favorite part about this vinyl type in particular is that you don’t have to paint it (since it’s already bright white) and it won’t warp due to the moisture in the room. When you’re done, top it off with a piece of vinyl chair rail, and caulk any visible edges for a perfectly finished look. Of course, you can also run the beadboard right to the ceiling and finish off with some crown molding or quarter round. 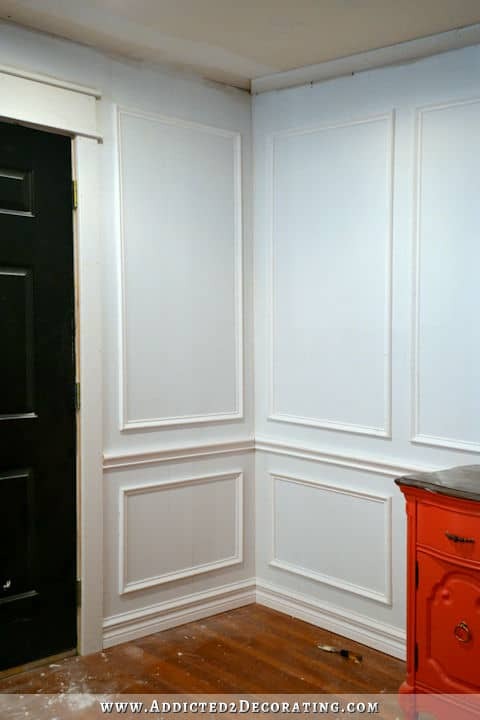 Shadow box wainscoting (also know as picture frame wainscoting) like what I’ve got throughout the most of my house is a very traditional detail that adds so much character. In fact, the wainscoting throughout our home was one of the primary reasons we fell in love with it to begin it! While we were lucky enough that this wainscoting already existed, your builder grade home can achieve the same look quite easily – whether you opt for this wall treatment in one room or throughout your entire home. My wainscoting is a full panel with the shadow box added on top as well as a chair rail. If your walls are in good condition and relatively level, you can skip the backing and just add the square trim and chair rail. Purchase some inexpensive quarter round from the hardware store as well as a miter box (if you don’t own a compound miter saw like we do) to cut the right angles that you’ll need for professional looking cuts. Cut your trim pieces, attach to the wall using a nail gun and caulk the seams for a clean finish. Finally, add the chair rail to the top and you’re done! Paint with some crisp white satin or semi-gloss paint for that classic finish. Feeling a little adventurous? Don’t be afraid to go with a color other than white. If you want to add some real drama, consider stacking two shadow boxes vertically or even creating one large rectangle that spans the height of your wall. Had Enough of The Wood Options? 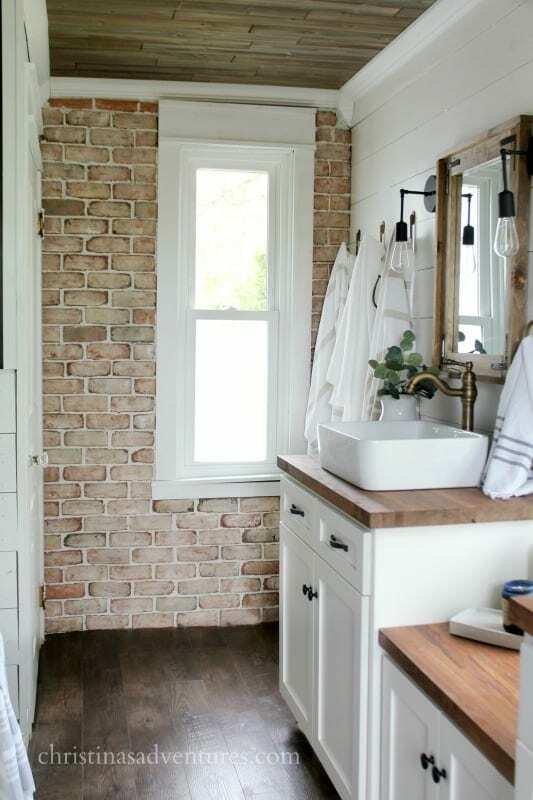 A Brick Wall Might Be More Your Style! Adding a brick accent wall is another way to add stunning architectural detail to a room. I personally prefer using it as an accent wall but it really adds a touch of “old” to even a brand new home and brings warmth and character. There’s two main ways to achieve this look in your own home; brick veneer (real brick planed down) or faux brick wall panels. What is the fifth wall you ask? The ceiling! This part of a room is often neglected but can make a huge impact to a space. You can of course paint it a different color but other options to really add some character include adding ceiling medallions, adding beadboard or planked wood (just like from the walls!) 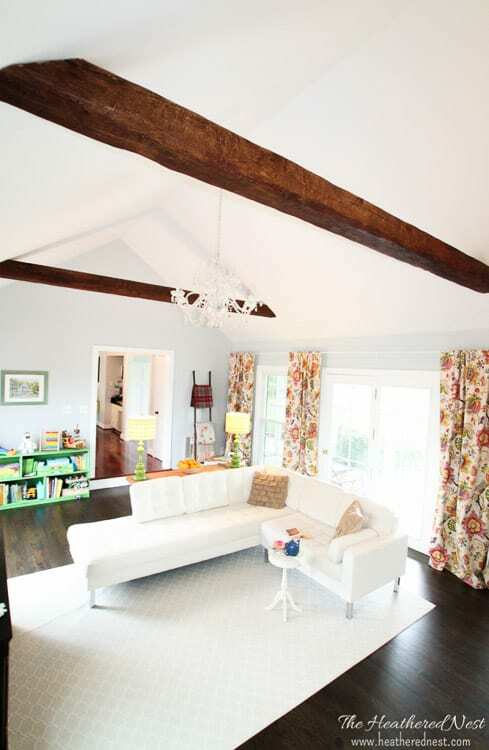 or even faux beams. Again, these are all completely do-able DIY projects! Adding new trim to a window or door can instantly transform a space. This is also a very affordable way to add character to your home. 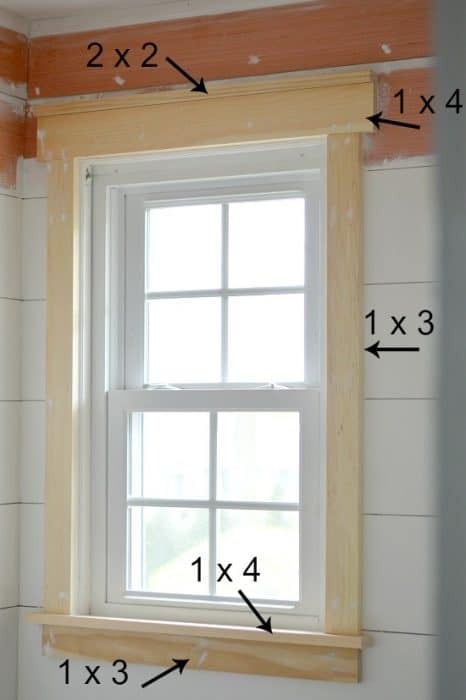 In my powder room, we opted for a simple craftsman style window trim that was a quick and inexpensive DIY that didn’t require us to cut 45 degree angles! Do your doors have lovely new casing that just screams builder basic? 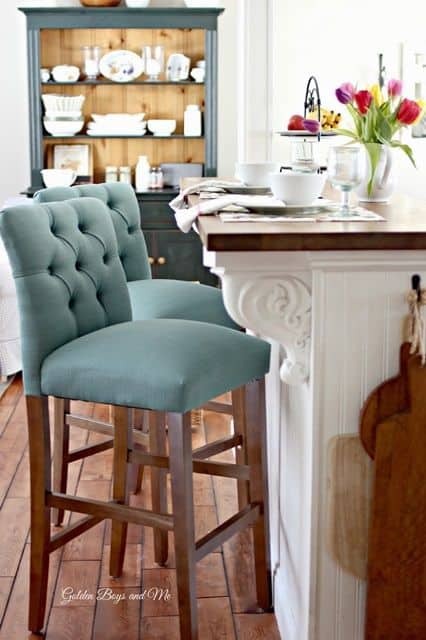 A simple way to add instant character is to add corbels! These are readily available online (I love this one!) as well as from Home Depot and will completely transform the look of an opening. 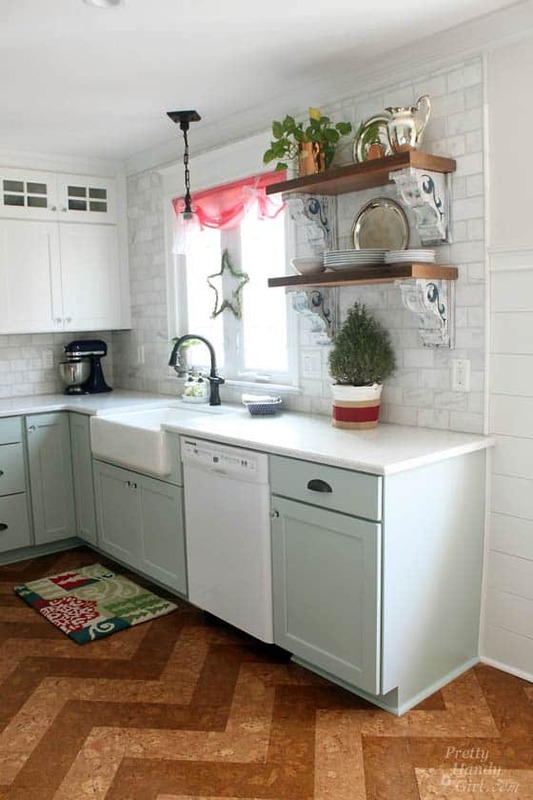 Corbels can be used in a variety of other ways including under bookshelves and under countertops. Finally, add character to your home by carefully choosing what you add to it. Bringing antiques and vintage items in will instantly make your home feel lived in and add interest. If bringing the old in doesn’t necessarily work with your style, make sure that you’re varying your home decor and furniture, i.e. not buying “matching sets” of everything! Use warm woods, distressed finishes and even mix metals to steer away from the dreaded “cookie-cutter” look that a builder grade home can have..
You see? There’s SO many ways you can add character to your home, whether it’s a new build that you want to make look old or just a new-to-you home that lacks charm. Don’t forget that a home isn’t built in a day, so take your time and figure out what will work for you and I know you’ll be able to turn that cookie cookie house into a home that you love!